Musicians and artists have always shared mutual interests and exchanged theories of art and creativity. This exchange climaxed just after World War II, when a group of New York-based musicians, including John Cage, Morton Feldman, Earle Brown, and David Tudor, formed friendships with a group of painters. The latter group, now known collectively as either the New York School or the Abstract Expressionists, included Jackson Pollock, Willem deKooning, Robert Motherwell, Mark Rothko, Barnett Newman, Clyfford Still, Franz Kline, Phillip Guston, and William Baziotes. The group also included a younger generation of artists-particularly Robert Rauschenberg and Jasper Johns-that stood somewhat apart from the Abstract Expressionists. This group of painters created what is arguably the first significant American movement in the visual arts. Inspired by the artists, the New York School composers accomplished a similar feat. By the beginning of the 1960s, the New York Schools of art and music had assumed a position of leadership in the world of art. 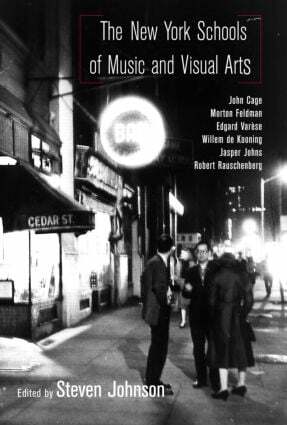 For anyone interested in the development of 20th century art, music, and culture, The New York Schools of Music and Art will make for illuminating reading. Stephen Johnson is a Professor of Music at Brigham Young University. He lives in Provo, UT.